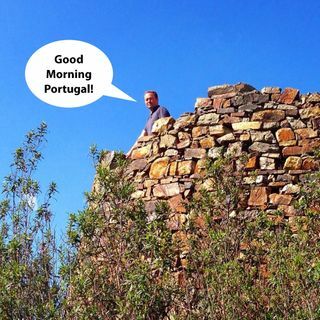 The Curia Move - Good Morning Portugal! Climate Change Before It's Too Late! Shooting Season in Central Portugal? Get Clear - Get Organised - Get Going! Meditation Made Simple. Does what it says on the tin ... no contorted postures, no allergy-inducing incense, no look-at-me-I'm-meditating outfits or furniture, just situationalist, here 'n' now, in this moment awareness. The recordings are created on location, in the here and now. There's background noise (AKA ... Más informaciones reality), which we deal with as part of the process. Each is an experiment with no guaranteed outcome. Some 'experts' on meditation will be appalled, whereas new-comers without that kind of judgemental baggage might just enjoy this no-nonsense, easy-going and straightforward approach. Carl also takes requests on themes and locations, believing that meditation - in its deepest sense - can take place anywhere and for anyone. "Frivolously deep", light-hearted and cosmically humorous with no mantra but some''bant-ra', for some this is marmite meditation, for others a quick and dirty, blessed relief. A regular look at how we can harness the power of the planets to make our life easier, more joyful and to gain understanding. Louisa and Carl keep the show lighthearted throughout and also offer 3 free listener readings per show. Want to ask a question? Why not call in to the show on Carl's What'sap number +351 913 590 ... Más informaciones 303 (it’s free!) - or join us in the chatroom. Check individual show times as these are subject to change. The Barefoot Broadcast began on the 27th September, 2010, with the intention of sharing transformational people and ideas in an upbeat and light-hearted way. Within a couple of years and 400+ shows later, that have attracted nearly 100,000 listens, The Barefoot Broadcaster - Carl Munson - drifted back to more mainstream endeavours. Together now in 2018, they present to you the all-new Barefoot Broadcast, a positive start to your day, reviewing some of the guests and ideas from the old days, with insight, inspiration and a reminder that life is good and best well-lived. Looking for property for sale in Portugal for smallholding, self-sufficiency, permaculture, off-grid living, or just to “Live the Good Life”? We find the properties that make your dream a reality! Smallholdings, farms, ruins and renovation projects, renovated country houses, rustic land for yurts or caravans (we also sell yurts and ... Más informaciones other eco homes! ), water and windmills, and equestrian property.